It is impossible for them to do it alone. And that is why I am writing requesting that Canada safeguard disability rights by ratifying the Optional Protocol on the UN Convention on the Rights of Persons with Disabilities (CRPD). My sister, Teresa Pocock, is featured on the Change.org petition which more than 26,000 people have signed and which calls on Canada to ratify the Protocol. We have a momentous opportunity. Canada is on the brink of bringing in new “accessibility” legislation. This is the perfect time to ratify the “Optional Protocol”. It can add the international enforcement teeth that are so badly needed to protect and assert the rights of the disabled. Unless people with intellectual disabilities have a deep-pocketed champion, they are defenceless against a system that routinely bullies them into medicalized “care” and segregates them into various forms of restrictive institutions, from long-term care homes to group homes. “Right now, within our current legal framework, the rights of those of us with disabilities don’t kick in, for lack of a better word, until our rights have been violated. The current system unfairly burdens Canadians to ever defend our rights,” said Carla Qualtrough, the Minister of Persons with Disabilities. We have a chance in Canada to make bold changes. Minister Qualtrough has invited Canadians to advise her on accessibility legislation. When we hear “accessibility legislation”, many of us think of ramps and elevators, but the glaring problem we need to fix is how to protect the basic human rights of people with disabilities. Across Canada, our patchwork quilt of laws is failing them. Thousands are having their rights to liberty and independence trampled in the name of “care” and convenience. I know this from personal experience. In 2013, my then 49-year old sister with Down syndrome was forced into an Ontario long-term care home that specializes in “dementia and palliative care”. She had no medical need to be in long-term care. Her human right to choose where she lives was taken away from her in a series of shameful bureaucratic errors and missteps. I spoke up: “You can’t do that! It’s against Teresa’s human rights to put her away in a nursing home.” But it was like I was standing on a train track, waving my arms and blowing a whistle. No one listened — the train, loaded with Ontario government officials and their agencies, ran right over me. Although we got Teresa freed, no official would admit they’d done anything wrong. Initially, I believed that my sister’s experience was an isolated case. But segregation of people with disabilities is a big problem all across Canada and in the United States. There are many “Teresas”. How many people does this affect? How many are being misplaced in long-term care? In July 2016, Global News Toronto reported that more than 2,900 Ontarians with developmental disabilities live in long-term care facilities. Read that shocking number again: Two thousand nine hundred people with developmental disabilities live in long-term care facilities. If you don’t have the money to go to court, the rights of the disabled are virtually non-existent. The Canadian Charter states that we are all to be treated equally, without discrimination due to mental or physical disability. The Convention on the Rights of Persons with Disabilities declares that disability is not a justification for taking away that person’s freedom. 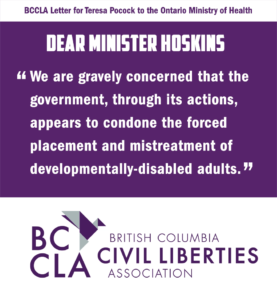 And yet, The National Task Force on Living in the Community has found that, “In many provinces and territories persons with intellectual disabilities are being admitted on a routine basis to institutions, directly violating a stated policy of deinstitutionalisation”. Their estimate is that over 12,000 Canadians with disabilities are living in health related institutions across Canada. Putting people into long-term care homes is a horrifying throwback to the 1950’s when people with Down syndrome were routinely institutionalized. The United States (prior to Donald Trump) was doing a much better job than Canada in protecting the rights of the disabled to live in the community. Indeed, the U.S. Justice Department has a long history of standing up and defending the civil rights of persons with disabilities from discrimination, segregation, and loss of liberty. Their success is due to aggressive enforcement. I was so surprised to read about their advocacy that I drilled down further. In 2009, President Obama said, “The Olmstead ruling was a critical step forward for our nation, articulating one of the most fundamental rights of Americans with disabilities: Having the choice to live independently”. Obama tasked the Justice Department with aggressively enforcing the Supreme Court ruling, Olmstead vs L.C. and the Americans with Disabilities Act. Since then, they have launched 50 investigations and settled cases with eight states. Imagine if Canada actively protected the fundamental rights of Canadian with disabilities to choose to live independently. It would be revolutionary. To do this, Canada’s new law must include a robust enforcement mechanism — and that can work hand-in-hand with the UN CRPD. On July 22, 2016, Christina Stevens at Global News pressed the Health Minister Eric Hoskins for an apology for Teresa. He sent a statement: “I would like to apologize to Ms. Pocock and her family for her being placed in a seniors residence. All Ontarians deserve to be treated with respect and compassion as they navigate our system and that includes receiving care in an appropriate setting.” In November 2016, he sent Teresa a formal letter of apology. Hoskins’ apology to my sister is welcome but falls short of what is needed. No explanation was given as to why the system failed her. Over the past three years we have filed multiple complaints with the government and the agencies responsible. We submitted freedom of information requests and PHIPA requests. We have been doggedly collecting the evidence to understand how this travesty happened. If we don’t admit the mistakes that were made, history shows they will be repeated. If the CRPD had been in place it would have helped us to hold the Ontario government, and its agencies accountable for the grave violation of Teresa’s human rights. Instead we were left to fight the Ontario government on our own. Please ratify the Optional Protocol. It will give disabled Canadians the sharp teeth they need to protect and enforce their rights. Thank you so much to those of you taking the lead to set this right. This was brilliantly written. It was not overly dramatic but did convey the stress and frustration the family endured. Thank you for being brave enough to fight not just for Teresa but all all those with disabilities. Keep pushing, you are almost there. I am one of the 26,213 people who signed the petition started by Change.org demanding human rights for disabled people. No longer should they have to be placed in palliative treatment in the long-term care of nursing homes. This is inappropriate….. and I must say, unfair. Many levels of authority have been petitioned to put an end to this mistreatment. Endorsements have been made for change at appropriate levels of government in Canada, yet there has been no follow-through corrective action taken. Why not get on with the right decision and end the unfairness to people who must depend on others to take this action for them? Is any prolongation of the process justifiable? I think not. End this unjust treatment and give appropriate care for those who cannot fight for it themselves NOW. As Mom to a 20 year old cerebral palsy son, this was a brilliant read! I am one of the people who signed the petition, and this was a powerful piece for me. Powerful, wonderful read and long overdue. What about those who are vulnerable because of brain injury (FASD, ABI, undiagnosed brain injury, high functioning ASD) who do not qualify as intellectually disabled because of some ridiculous 2nd percentile cutoff? Current life expectancy of an adult with FASD (fetal alcohol spectrum disorder) is 34! Unfortunately FASD is often an invisible disability that leads to behavioural and cognitive issues that leave those living with it in dire straits as they become adults. Our prisons, streets and mental health facilities are filled with those who, through no fault of their own have no place to go. I think I need to start another petition :). Thank you for putting a face and story to those like Teresa who are caught in this bureaucratic web. A well written article. I signed the petition. However, I am not convinced that signing the Optional Protocol will do much for people with a disability in Canada. What person with a disability has the money to hire a specialized lawyer to appeal to the UN? Pressure on the Minister and the PM to adopt a Canadians with Disabilities Act would probably be more effective if the Act does not require an expensive lawyer to argue before a judge to obtain redress for the violation of someone’s right(s).